The Supreme Court on Feb 18th 2014 finally put an end to the endless ping-pong between the judiciary and executive by commuting to life the capital sentence of three of the assassins convicted of killing former PM Rajiv Gandhi, 15 others, and injuring, some grievously 45 innocents. For high quality commentary on this topic head over to Centre Right India where Amar and Aravindan have written well informed and contrasting takes on the topic. I would like to add my bit to the discussion largely supplementing what these two commentators have written. On a searing hot night of May 1991 a devilish conspiracy was brought to bear. The above picture is an especially poignant one which I found on Shri Ajay Makens twitter profile. 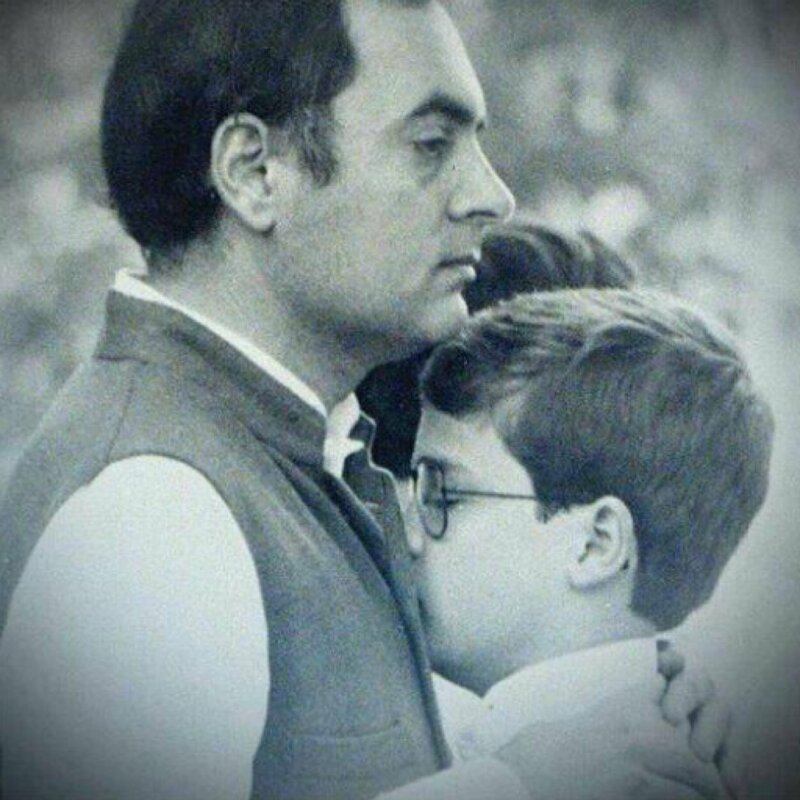 Regardless of my political position, I recognize the emotional devastation of losing a father in his prime that has been endured by Rahul Gandhi. The reason I use this image is to show that exactly the same impact has also been felt by the children of 15 others who were killed that night. It is easy to get carried away by the medias constant one sided sob stories of the assassins about how Jail life has been so hard on them and families. It is essential you keep this balance in mind. Those who have brought into the idea that the whole case is fabricated and these people are innocent can stop reading now. Read about the case first and then come back and continue. This post is also not about the desirability of the death penalty. We assume it is on the table, like it is, and the only issues are those surrounding the administration of it. Google tells us that the average time spent on death row by a criminal before being executed in the United States is 10-15 years with many going over 20 years. This includes the sensational case of Jack Alderman who was executed in 2008 after 33 years on death row. Whether this is desirable or not is a separate issue that ties into the larger abolitionist debate. Warts included we do have a grip on the vexed question of sentencing guidelines; of which murderers get picked for capital punishment and which ones get life terms. The issues surrounding the political mercy process is where the trouble lies. Perarivalan: For about 8 years, I have been serving sentence as death sentence convict. So, the sufferings of my parents, brothers, wife and daughter can not be described in words. I ask God daily why they should suffer due to m.. They also highlighted sufferings on account of solitary confinement, mental agony, etc. Remarkably the honorable court seems to be satisfied and moved by these letters about the mental state of the criminals. The lack of remorse and evidence of reformation in these convicts arent examined. No doubt, this is a complex issue and there are strong arguments for the so called “Death Row Phenomenon” that the court has accepted. However one wonders if a medical mental examination could prove that this state of limbo (but living) had a real medical impact on them. The alternative opinion may be illustrated by the following game. Say you grant a criminal on death row a choice between two processes for a mercy petition. Choice 1: (Fast Track) – petition will be disposed off within 6 weeks, if delay is beyond that you live. But you die immediately if rejected within 6 weeks. Choice 2: (Slow Track) – petition has no time limit, you live until it is decided, appealed, then decided again. Which choice do you think the prisoner would take? I think most would instantly opt for the second choice. The second choice leaves wide open the possibility that the politics of the country could, in the interim, abolish capital punishment. So instead of the absolute mental state the relative choices have to be examined. After all, the very fact that you are in jail and not outside isnt particularly pleasant for the born free mental state either. There is no accountability for such sloth. Furthermore there is no check to ascertain that this sloth is only due to a general malaise of incompetence or something more sinister. Now consider the following scenario if only delay can lead to commutation in the absence of accountability. A babu or a babu in collusion with a politician now possesses the power to commute by simply ignoring a petition. Armed with this power they can act maliciously by choosing to immediately forward petitions of persons belonging to rival tribes while holding back those from their own tribes. This leads to various anomalies and the storm being raised by Ms Mehbooba Mufti in Kashmir about the process for Afzal Guru is the best example of this. Of course the state will have no answer to Ms Mufti leading to erosion of trust in the residual elements of Rule of Law in India. If these criminals are to go free due to executive delay, then those responsible for the delay must go to jail. There is no way around this. Predictably the entire Delhi media and the Congress and BJP exploded at Jayalalithaa for her decision. Folks seem to place a great emphasis on Jayalalithaa’s alleged papering over procedural checks in Sec 432 and 433 of the CrPC; but reality is that for a government it is not a huge ask to fulfil these checks. If you instead look at the substantive end of the case Jayalalithaas actions could be justified. 1. The intensity of activism in a model Idea of India state like Tamilnadu needs to be taken into account. 2. The court have not only commuted the sentence but also approved that the prisoners endured mental torture over 14 year delay. 3. The court did not expressly opine on the desirability of Sec 432/433 IPC ; quite the opposite hinted at the applicabilty of these provisions to the current case. This has been expertly picked up by Vaiko and a host of other parties. 4. Once there three major convicts (Murugan, Santhan, Perarivalan) are released, it makes little sense to hold the other 4 serving life terms (Nalini, Robert Pious, Jayakumar, and Ravichandran) – so she had to let go all seven. 5. Given the above facts; the Jayalalithaa govt would be seen as nursing a personal grudge based on you-know-what in Dravidian terminology. 6. Jaya would like to have the Central Govt to hold this pot by invoking & interpreting Sec 435 of CrPC appropriately. The trajectory of this case over the years is alarming and exposes the chinks in the Rule of Law and its vulnerability to activism and sectarianism. I would go a step further and say this case lends further credence to my hypothesis that the Rule of Law cannot go along with the Idea of India. Under the guise of abolition of death penalty, a whole set of arguments are being made to let these convicts go. It is important to note that none of the convicts have demonstrated an iota of remorse or disowning of their ideology. Instead their capture, their trial, and incarceration are portrayed as further evidence of the oppression of Tamils in India and in Sri Lanka. The restless eagerness of Murugan for a reunion with his daughter in London can only be understood by Rahul Gandhi who does not have that option any more. Sushma Swaraj of the BJP is a Lokpal Selector Selector Selector. So are Prime Minister Manmohan Singh, Speaker Meira Kumar, and Supreme Court Judge H.L Dattu. Together these four are going to first select an “eminent jurist” who will complete a 5 member committee whose only job to select another committee who will eventually select the inaugural 8-member Lokpal. You may wonder what Justice Dattu is doing here, because as per the Lokpal Act the Chief Justice of India should join this panel. Actually as per the Lokpal Act, the CJI or anyone he nominates can be on the panel. The catch here is those on the selection panels cant aspire to be Lokpal. It would be tantamount to selecting yourself. So CJI Sathasivam has kept the doors open for himself to be a Lokpal. This five-member selection committee will choose the Lokpal and other members. That a premier Indian newspaper like the Indian Express gets a crucial detail totally wrong is astounding. Lets clear it up. As per the Lokpal Act Sec 4 (3) The task of these 5 people (assuming they can select the eminent jurist) is to select a “search committee” consisting of seven eminent people of standing. Search Committee consisting of at least seven persons of standing and having special knowledge and expertise in the matters relating to anti-corruption policy, public administration, vigilance, policy making, finance including insurance and banking, law and management .. The restriction is that the eminent people of standing in the search committee should have 50% quota for SC/ST/OBC/Minority/Women. The search committee then selects the final Lokpal panel which consists of a Lokpal and Eight members. Five of the eight must be from SC/ST/OBC/Minority/Women and four from the legal field. UPDATE: Thanks to a commentor, this isnt correct. The search committee does not actually select the final panel but returns the names to the original selection committee which then adds its own names and selects the final panel. – EDIT – In my opinion this only makes it worse. Is your head spinning yet? Is this feasible ? Today, we are at stage 0 – the discussion revolves around whether PP Rao is a more eminent jurist than Harish Salve or Fali Nariman. Tomorrow a dozen supreme court justices will compete for the judicial slots. A thousand NGOs and activists will compete the the “civil society” slots. The sheer energy spent by all those in the ecosystem will be astounding. Who do you leave out? Packing Lokpal with Congress loyalists? Sushma Swaraj is fighting all the way to the president while Manmohan Singh and others wont budge. This is an all too familiar sight and expected because of the high stakes involved. Simply put this is an institution that is begging to be captured. The multi stage selection of Lokpal enhances the possibility of total capture – because if you capture a bare majority of selectors at Stage 0 – then ALL selectors at Stage 1 can be owned. This is perhaps the reason why Mrs Swaraj is so worried. The caste and religious quotas for the search and final Lokpal will see extreme involvement from political outfits as they will veto candidates who are not seen to work for the benefit of these classes. The Lokpal also suffers from fatal flaws in paneling. It is too much to go into it in this post – but a quick point. If the rationale was to ensure communal representation in a judicial/investigative body to protect the interests of those defendants – then paneling (selecting two/three member “benches”) defeats the purpose. Mark my words this will be an explosive issue in the future as both defendants and litigants will question the neutrality of any panel on grounds of religion, caste, or gender. What they are really expecting is like a representative jury system. Modi should watch the developments carefully as a loaded Lokpal can dissipate any projects that he might embark on. There is enough ambiguity on the statute books and enough well paid activists to checkmate any discretion on the part of officials executing these projects. Given the horrendous implications of this ill conceived piece of legislation on our economic well being – it is perhaps good that they are not able to start the engine. Please lets not call the mechanic.